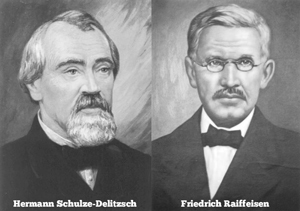 ​Moved by the crop failure and famine that had devastated Germany in 1846–1847, Hermann Schulze-Delitzsch and Friedrich Wilhelm Raiffeisen created the first true credit unions in the mid-19th century. Schulze-Delitzsch had previously organized a cooperatively-owned mill and bakery that sold bread to its members at substantial savings. He took this cooperative notion to address the needs of credit and in 1850, he organized the first cooperative credit society, known as the people’s bank. ​Raiffeisen sought to provide credit to farmers. He formed the Heddesdorf Credit Union in 1864 to help German farmers purchase livestock, equipment, seeds and other farming needs. The first credit union in North America opened in Quebec, Canada, on Jan. 23rd, 1901 with a ten cent deposit. Founder Alphonse Desjardins, a reporter in the Canadian parliament, was moved to take up his mission when he learned of a Montreal citizen who had been ordered by the court to pay nearly $5,000 in interest on a loan of $150 from a moneylender. Desjardins later helped establish the first credit union in the United States, St. Mary's Cooperative Credit Association of Manchester, New Hampshire. Attorney Joseph Boivin was the volunteer manager of St. Mary's, and ran it out of his home in the evenings. Boivin’s former home, where the first American credit union was founded, is now occupied by America's Credit Union Museum. Click the image below to expand the full timeline and learn about the historical markers in the CU movement. There's nothing like a corny video (brought to you by On Your Way Videos) to explain the history of the credit union movement. Wow, there are a lot of people who had a heart for providing fair, honest finances to hard working people.